I found a large, clear, sphere-shaped glass bowl at a floral supply shop. A glass vessel of this shape is called a “rose bowl”, and they come in many different sizes—mine happens to have a 15″ diameter at the widest point. Part of the success of these types of container gardens is providing for good drainage because glass containers don’t have bottom drainage holes like regular flower pots. You can use any size glass container to make yours, ranging from a jar or brandy snifter to a fish tank. 4. Now, add enough potting soil so that the total contents occupy about 1/4 of the container. There will be some settling of the layers. Mine settled about 3/4″ over about 6 months, so add extra soil to account for this. You can find miniature plastic animals on Amazon (or most toy stores) and ceramic animals at GreatThailand.com. If you’d like to add people to your terrarium scene, check out stores that sell model train supplies. The most important thing about the care of this type of garden is to avoid over-watering. As I mentioned before, there’s no drainage hole, so add enough water so that the soil is just moist. It’s best to err on the dry side because too much water will cause your plants to rot: there should never be a pool of standing water in the bottom pebble layer. I also recommend not fertilizing the plants in order to ensure that they remain small. My garden is placed on a coffee table in the center of a medium-sized room that has two windows, which seem to provide enough light to keep it alive and well. Yeah, terrarium building can be very rewarding. I would be careful of using an asparagus fern in one though. They don't like to be constantly wet so they are totally prone to overwatering. I just recently posted an article on how to create your own maidenhair fern terrarium here. Cool post! I recently did a post on my blog on how to make a terrarium on a budget. I found some little deer figurines similar to the one in your first pic. 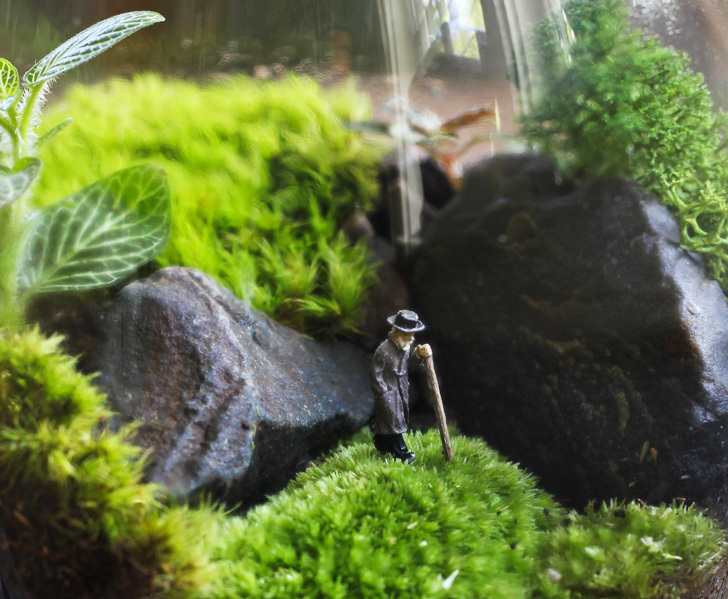 I find that introducing a scale figure that matches the miniature stature of the plants can really set off the whole terrarium and make it more of a small little world. This is a very cute idea, and I love the pictures. I recently made a cute terrarium with shark teeth instead of pebbles, and did it all for under 5 bucks that you can check out here! Very informative, good read, thank you! can you make one of these with water in it? and plants and stuff of course. I cannot get any sphangum moss in my country, for some reason, can I use another type of moss? This needed a more positive ending response. 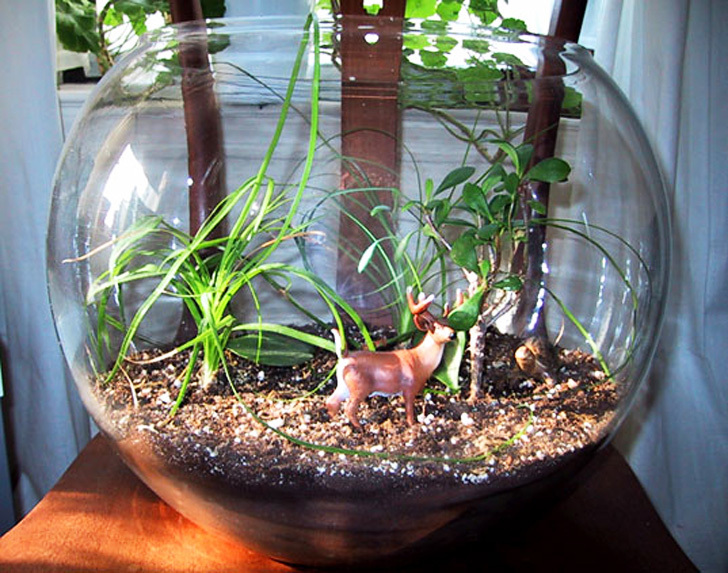 The definition of terrarium is "a ...container, partially or wholly enclosed, to grow plants in. What a beautiful centerpiece! This is not a true terrarium since it is not sealed. It is simply a container garden. A true terrarium is self sufficient in all it's needs except for light. That is why it is sealed so the humidity will condense and water the plants. I am surprised this web site would print this article as an information source for making a terrarium since it is obviously NOT a terrarium. Use activated charcoal, like you would for a fish filter. Most mega-markets have them in milk-llike cartons in the pet section. If you can\'t find any; try a pet store. It is about $3 for a pints worth. You will get hooked on trerrariums. Where can I get a supply of charcoal for a reasonable price? can i grow rose in terrarium? HOW TO MAKEDIFFERENT TYPES OF TERRARIUMS IN NARROW BOTTLE? Looked up how to make a terrarium and I love what you have done with yours. I have some little frogs and Salamanders I collected from my woods and for the Grandkids decided to make something low maintance. I place at the bottom of mine, Charcoal as you had suggested and then some wood chips, moss, and baby ferns, all from my woods. I love looking at all the life inside my little zoo. I will be feeding them some baby crickets this winter and I know my grandchildrens will enjoy watching the little guys grow and move around and eat. Thanks for the tips. Can some potential containers be considered too large for this type of project? I have two 25 gallon glass jugs that I want to use for this purpose. Any advice or information would be genuinely appreciated. wonderful information! I can't wait to get started. I am going to make one for a very special friend and one for myself. Thank you for making it sound so easy and I am sure I will have fun doing it and giving one away. Best to YOU! Thank you for the great idea! I am going to use my old 3/4 gallon fish bowl and cute miniture hippo handmade in Kenya. If I'm successful I can show it to my biology majors class and hope for more points as someone else suggested! thanks for the help! i hope it helps my grade out in botany! Nice Job! I been wanting to set up a terarium and a small microcontroller to log the air and water temp.,& CO2 levels. Can anyone suggest any hardware? I'm going to try this with a group of elementary students. Thanks for the details! This is a great site, thanks for all the help!!! Super cool! Thanks for the inspiration! Your terrarium is so cool! Thanks for the inspiation! Awesome! I got the link to this page from the MAKE blog. Would it be possible to use live animals (turtles, worms for the dirt, etc.)? Ah, finally I have the secrets. I asked Melissa once, after I had admired her terrarium, to tell me how to make one. All I could remember was: get a bowl somewhere in Chinatown, add dirt and some small plants, then ta da! But oh no... it's not that simple. Now I have it all in point form! Thanks Melissa, there is nothing better than making beautiful things on your own. PS. What was that you said about turning fabric into art? It's all about creating your own Forest of Endor...complete with AT-AT? Terrarium: : a usually transparent enclosure for keeping or raising plants or usually small animals (as turtles) indoors. Seeing as an enclosure doesn't have to be airtight (a fence can be an enclosure), it doesn't appear that being sealed is a necessity. I thought terrariums were supposed to be sealed - so that the water would evaporate and condense over and over? Do you water by pouring from a can/cup or with a spray bottle? I'd think a bottle would work pretty well for making sure you only get as much moisture as you need in the tank. Awesome... I'm going to put dinosaurs in mine! Normally, I don't really get into sites because I am a lone wolf that pretty much goes my own way, but I am very creative and love aquariums and terrariums as well as painting, scetching, paper macheing, latchhooking, looming, interior designing and various other mediums of my own choosing. This is a very nice way of expressing one's own creativity. Thank you for the tour! For those who would not be satisfied with ordinary plants, you can order carnivorous ones online. I'm planning to make one of these with pitcher plants. I love Melissa's terrarium! I think the personal and particularly creative details (like the deer) are part of what makes it so supercool. Fabulous. Now can we convince Melissa "earth-mama" Cotton to tell us how to make air-plant art? 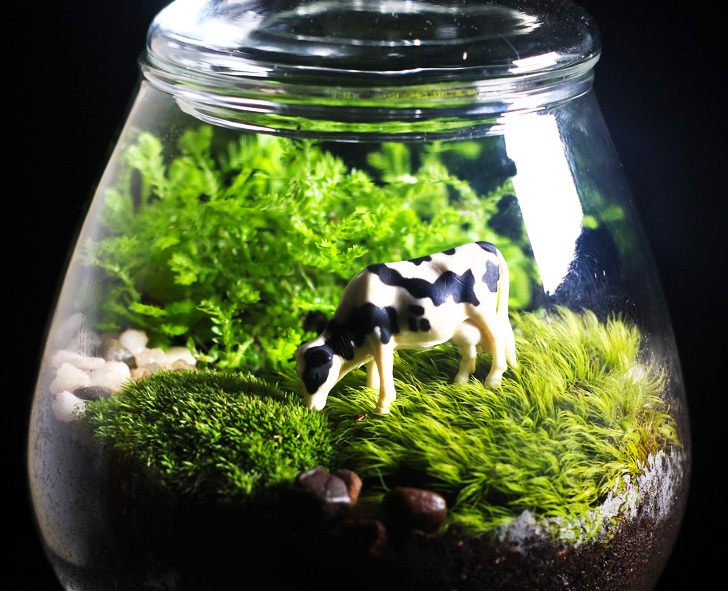 Making your own terrarium is fun and easy to do, and you can get super-creative with figurines of all shapes and sizes. Melissa's fabulous terrarium, complete with snail and deer figurines. You can use any shape or size glass container for a terrarium, from a candy dish or brandy snifter to a small jar, or 20-gallon fish tank. Animal figurines are also great for creating a unique scene. Miniature plants are your best bet, as they won't overpower and outgrow the terrarium glass. Melissa's terrarium is the centerpiece of her apartment, and yours can be too!